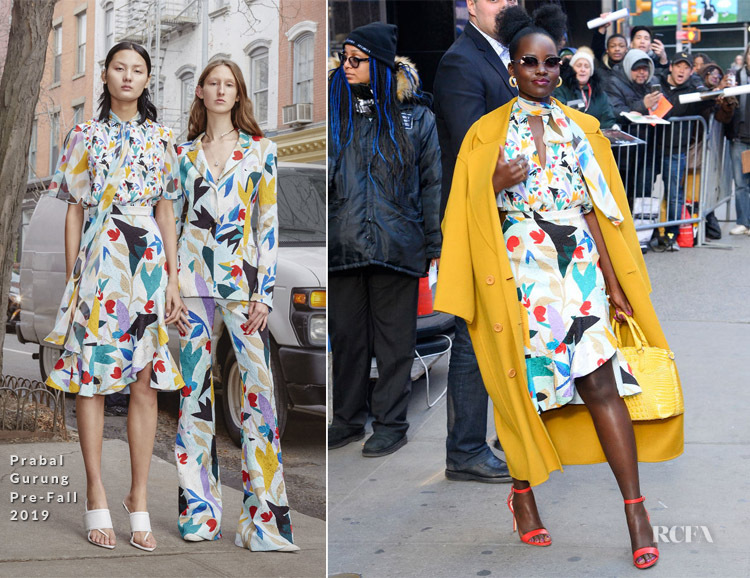 It’s a new dawn, and a new day for Lupita Nyong’o and her promo tour for ‘Us,’ so the actress blessed us with yet another colourful look while making her way to a studio in New York City for ‘Good Morning America’ on Tuesday (March 19). Did I say that her Bande Noir was my favourite look from Lupita? Well, I might just have to change my mind because her second look from the Prabal Gurung’s Pre-Fall 2019 collection is everything I never knew I wanted, and needed in my life until now. You know me. I’m a “take that coat off, let’s see the dress” kinda girl, but once again, this Mansur Gavriel cashmere coat makes the look. Along with the rest of her styling which included Nine West ‘Mana’ sandals, another pair of Alison Lou earrings in yellow plus a chic Brahmin bag. Which has been your favourite Lupita look so far?